A small note prior to this post: Once again we take a look back at the movies that we watched over five years ago and choose a Hall of Fame class, five movies that we thought embodied BMT in some way. Perhaps they were particularly bad, or an example of a specific bad movie trope, whatever, something made them stand out as special in our minds. Since we didn’t do email previews back in 2011/2012 we also decided to provide a preview for the movie as well. This is the fourth in a series of five leading up to our yearly awards the Smaddies Baddies. A recap (Hall of Fame speech really) will follow immediate afterwards to explain why the movie was chosen, things we loved about the movie, and things we discovered upon second viewing. Enjoy! 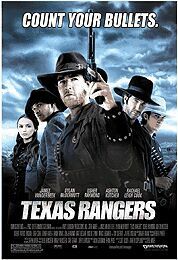 Leonard Maltin – 2.5 stars – Young man joins the recently formed Texas Rangers to avenge the death of his family and becomes an aide to the unit’s enigmatic leader (McDermott). Beautifully mounted widescreen Western isn’t bad, but its story is superficial and derivative. Of the young stars, Van Der Beek fares best, while Molina has fun as a sneering villain. This sat on the shelf for almost two years. Rotten Tomatoes – 2% (1/49): As far as westerns go, Texas Rangers is strictly mediocre stuff. The film was in development for many, many years. In its earliest stages, it was planned as a directorial project for Sam Peckinpah.